We'll take a look at this connection today to help you understand not only the importance of the connection but also provide some incite on balancing this if you find yourself challenged in this area. The first factor to understand is that approximately 2/3 of estrogen type hormones are created in the ovaries for women, while most of the other 1/3 are actually produced in the adrenal glands. Let's take this one step further to understand that men and post menopausal women are almost completely dependent on adrenal function for estrogen type hormones. It is important to understand that an array of hormones are necessary for optimal function in the body. These would include all the estrogen type hormones, pregnenolone, progesterone, different forms of testosterone, androstenedione, DHEA, cortisol and cortisone, just to name some of the key players. Interestingly enough, all of the hormones listed above are produced in the adrenal glands. Of course as you have learned earlier, the ovaries will also produce estrogen type hormones in premenopausal women and men will produce the bulk of their testosterone in the testicles until andropause. So as you can see optimal adrenal function is definitely a key here. If you had not heard me mention the likelihood of adrenal insufficiency in the past, here is a simple stat that I have recognized in my career in the health field. Through my years I have reviewed over 4,400 adrenal test kits. Now mind you, people that come into my office have health challenges, so these 4,400 plus people are individuals that are dealing with either diagnosed issues or recognized symptoms. Well, out of those 4,400 adrenal kits, I have seen only 5 come back optimal. Yes, ONLY 5! So basically, this means that if you have a health issue, there is only about a 1/10 of one percent chance that your adrenals are functioning optimally. I don't know about you but those do not sound like good odds to me. Let's now take this a step further into ovary function. As mentioned earlier, premenopause women will produce about 2/3 of their estrogen type hormones in the ovaries with most of the other 1/3 being produced in the adrenals. So if the adrenals are not working well and the adrenals play a direct role in the function of the ovaries, where the heck does the body produce estrogen hormones? Interestingly enough, I asked a client this today and she guessed correctly. In your FAT! So if you are not producing the optimal amounts of estrogen type hormones from your ovaries and/or adrenals, your body will pack on the weight just to maintain hormone balance. This is why women with poor adrenal/ovary function and post menopause women seem to carry extra weight that they simply cannot lose. This is simply because the body is using the extra fat for a necessary hormonal process. Sounds like a frightening cycle, right? Well, it doesn't have to be. It is relatively easy to test adrenal function. Here at Depke Wellness we almost always use a #205 adrenal test kit from a company called BioHealth to assess cortisol, DHEA, estriol, estradiol, progesterone, different forms of testosterone, melatonin and androstenedione. This provides us the necessary information to understand what is going on in your body from a hormonal perspective and there are even a few little clues about digestion here also. Once we have this information we can provide some feedback for supplementation to assist your body in resetting and balancing your adrenal function. For those in stage II or III we are talking a whole other ball game. 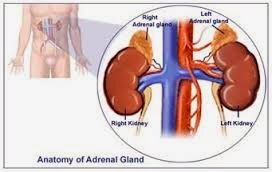 While it would still be important here to utilize the adrenal support a further step is need and this is due to the fact that these stages are also reflective of a "blown out" HPA axis, which stands for the hypothalamus, pituitary, adrenal axis. The job of this feedback loop is to bring your body into a relaxing state after a stressful event. I am sure that you "get" that we all have stress and honestly, stress is a necessary part of life. When the HPA axis is working properly your stress is balanced on a consistent basis, but when the HPA axis is not longer working instead of stress/balance, stress/balance, stress/balance, you end up with stress, stress, stress, stress....yikes! So once the HPA axis is "blown out" this needs to be reset and you can assist your body in resetting this feedback loop by using sublingual forms of natural pregnenolone and DHEA. I do caution you though. DO NOT use these randomly without proper testing and working with a practitioner that truly understands assisting your body in resetting the HPA axis. So in putting this all together to maintain proper hormone production throughout your life please be sure to maintain optimal adrenal function and absolutely stay on top of your triggers. If you are not currently a client of Depke Wellness and you would like to understand this deeper, we always offer a complimentary 20 minute phone or in office consult for new clients. Feel free to call our office at (949)954-6226 for this consult.